We had a wonderful first Thanksgiving here on the farm. Not only did it usher in the holiday season but winter in all her white glory decided the time was right to make an appearance. It made me extra thankful for the fortuitous calm before the storm as my husband and I decided to put a little added work into winterizing the chicken coop. Instead of starting construction of our kitchen island we felt it was best to take advantage of the nice weather and work on our coop. The windows were in such bad repair the panes jiggled and rattled anytime there was the slightest breeze. The frames themselves were barely holding in the glass which meant things weren’t secure enough for our harsh North Dakota winters. 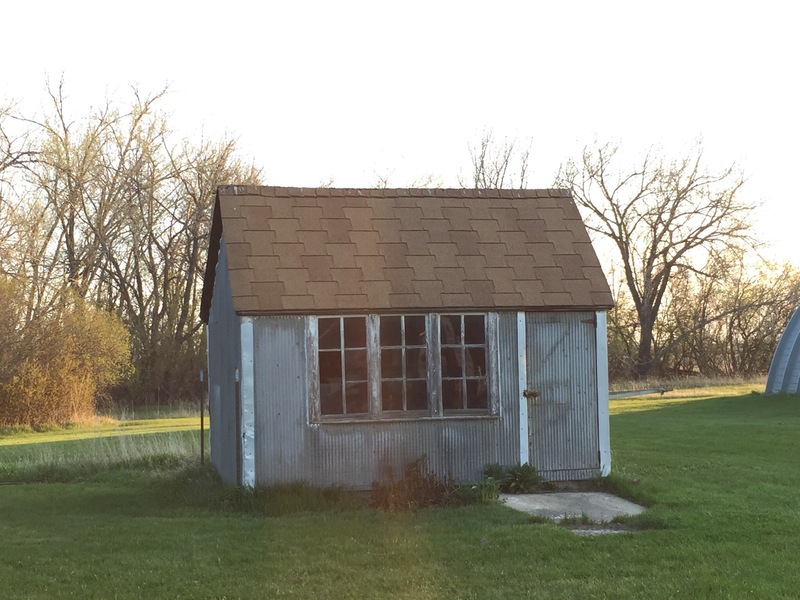 Earlier in the fall we had saved some double pane glass windows found in the house attic. I like to reuse items as much as possible and quick measurements confirmed they would work as great replacement windows, we just had to build frames. 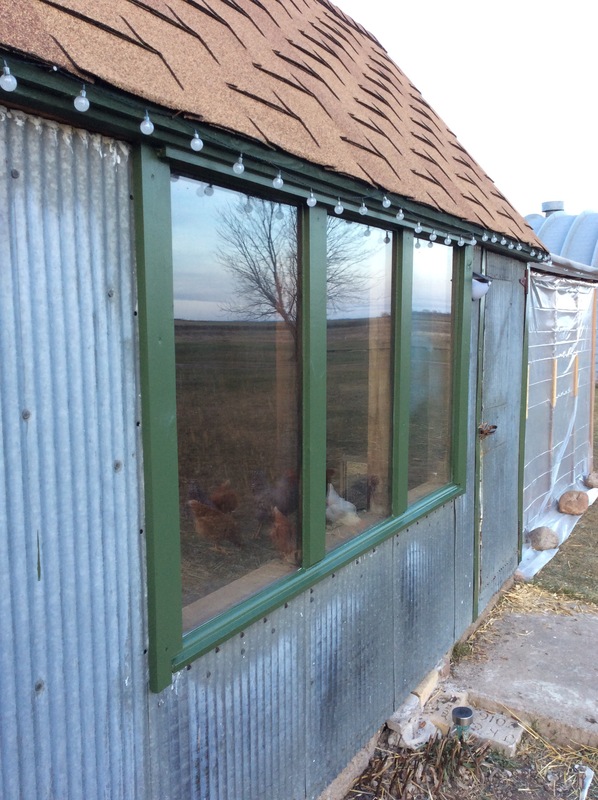 I would miss the look of rustic weathered wood and multi-pane windows in the coop but for the health of my flock it was best to make sure they remained warm. The final product turned out great. Not only were we able to install the windows, I was also able to paint the trim. If you aren’t from the north you may not understand my excitement in all this. It was so warm out for November I was working in jeans and a long sleeved t-shirt…that never happens in November! 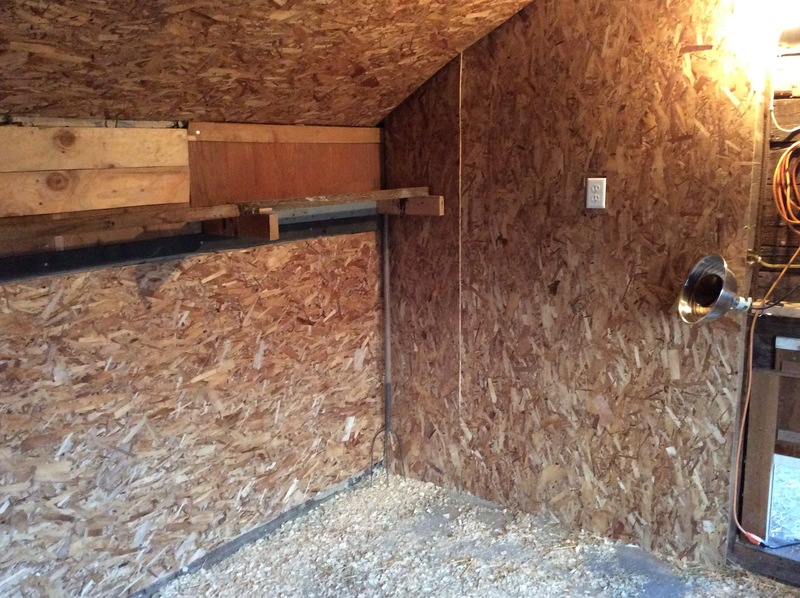 Earlier in the week I started the process of installing insulation in the coop walls. My thermometer had given me strong indications that very little heat was being held within the coop. As night progressed, the temps would plummet leaving my birds susceptible to bitter cold. 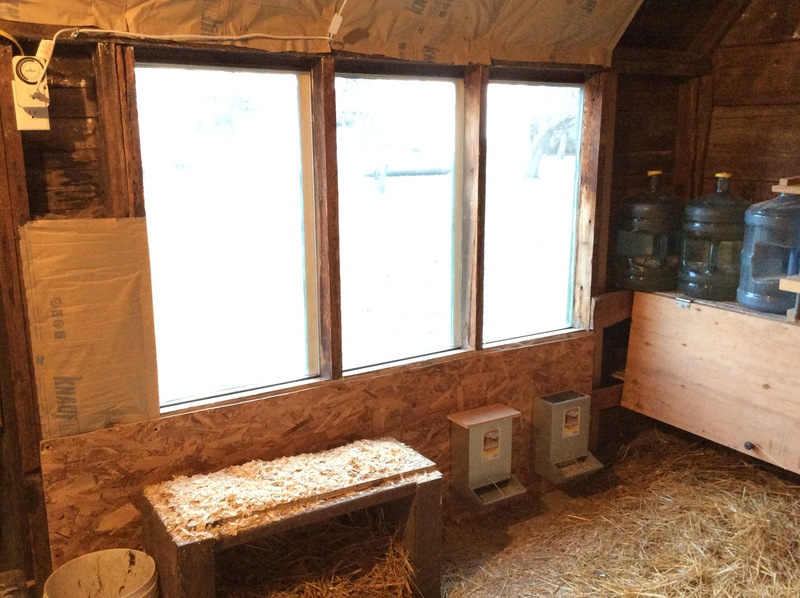 Even with the addition of a heat lamp timed to turn on every other half hour, my coop would drop far below freezing. It wasn’t even full on winter yet and a couple frost bite areas on my rooster’s comb had me concerned. Insulation was put in the walls and the roof along with a covering of wood board. The result is a cleaner looking and much warmer coop. Over the past few days (and during a blizzard no less), the coop hasn’t dropped below 40 degrees with no added heat source! I couldn’t be happier with the changes in the coop. During the warmer daytime hours I open the roof vent to allow for air circulation. At night I close everything up tight. It is pretty simple and now I’m not fretting over the cold temps. Another great addition I added a couple weeks ago was plastic sheeting on the covered pen. 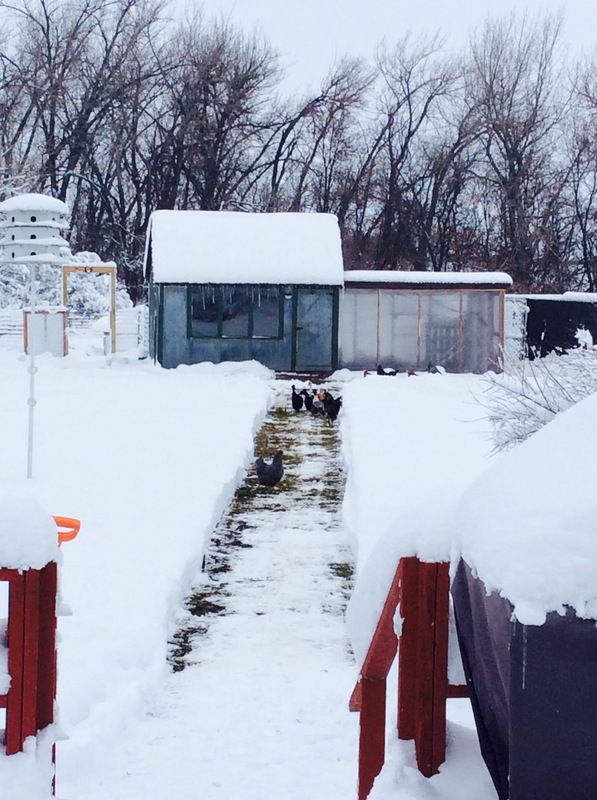 My goal was to keep snow out of the pen and allow my birds as much space to roam as possible. I couldn’t have timed it better! Our first storm of the year dumped over 12 inches of snow on the lawn. During the first 2 days, only the ducks were brave enough to venture 4 feet outside the pen. On the third day all the birds came out to inspect what little yard space there was. Because the snow was so deep, I had to remove snow to walk from the house to the coop and on to the quonset. I finally ended up blowing out a slightly larger area once they became more interested in being outside. Over time the snow will shrink and compact but for the time being their free range space just became much smaller. As we continue to dig ourselves out from under all this snow, I’m learning that winter preparation is not something we should take lightly. Living so remotely it’s not a simple feat to get to the grocery store or gas station. Food storage is a requirement and adequate wood for the stove is a necessity. 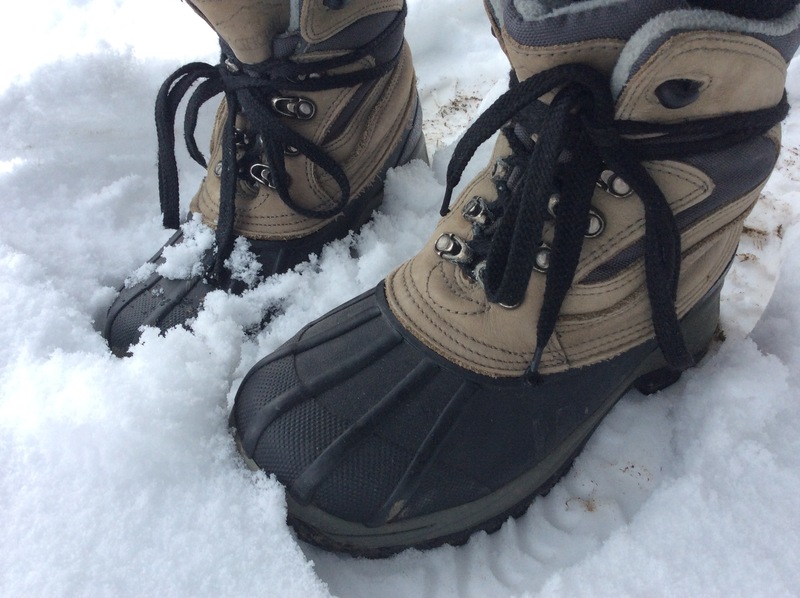 And, a great pair of quality boots coupled with a snow shovel will never let you down!